According to Eli Gould during the broadcast of the Truck Series race at Milwaukee, Dale Earnhardt Jr will do his best to run all 250 laps of tomorrow's Die Hard 250. X-rays did reveal a chipped shoulder blade. Dale Jr appeared to be in a considerable amount of pain as he walked to the ambulance immediately following the crash. It was good to see that he was able to walk to the ambulance, although he was holding his right arm which appeared to be the shoulder which was injured. He's a tough young man, not unlike his father. Our thought and prayers are with Dale Jr. Hopefully we will see him race tomorrow. We have no idea how this will affect his second Winston Cup race at New Hampshire International Speedway next weekend, July 11th. Ron Hornaday qualified Jr's car 15th for tomorrows DieHard 250. However, if Dale Jr can race tomorrow he would have to start at the back of the pack. If Dale Jr is unable to race tomorrow, Ron Hornaday will drive the #3 AC Delco Monte Carlo. 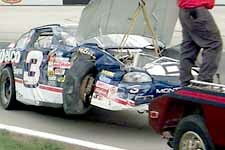 Dale Earnhardt Jr.'s crumpled No. 3 Chevrolet gets towed back to the garage area after a crash during practice. NASCAR Busch Series Grand National Division champion Dale Earnhardt Jr. was injured Saturday morning in a crash during practice at The Milwaukee Mile. He was immediately removed from the No. 3 ACDelco Chevrolet and taken to Froedtert Memorial Lutheran Hospital in Milwaukee where it was discovered he suffered a chipped right shoulder blade. Earnhardt Jr. was guiding the car through Turn 1 and upon his exit, the engine blew. The mechanical failure sent the car violently slamming into the Turn 2 retaining wall. NASCAR Craftsman Truck Series champion Ron Hornaday, who is Earnhardt Jr.'s teammate at Dale Earnhardt Inc., will take the reigns of the No. 3 Monte Carlo for Saturday's Bud Pole Qualifying. According to sources close to the team, there is little chance Earnhardt Jr. will miss Sunday's DieHard 250. Earnhardt Jr. won the NASCAR Busch Series championship last year in his first full season on the circuit. Currently, he sits atop the standings, leading Matt Kenseth, last year's runner-up, by 129 points. Earnhardt Jr. has three wins, eight top-5s and 12 top-10s in 17 starts in 1999.